"Wow, what a fantastic time I had in Russia! Once again your spirit for adventure, attention to detail, and appreciation for the variety of cultures have combined into a program so excellent that none other could compare." Walk the midnight streets of St. Petersburg when the sun never seems to set. Ride overnight on the famous Red Arrow Express train in first class cabins from St. Petersburg to Moscow and stay in the Red Square. Be welcomed to the Caucasus Mountains by the same guides, cooks and service staff that have been part of the BAI team since the beginning. Hike the most beautiful valleys in the Caucasus Mountains, not just the ones that are most accessible. Experience life in the Caucasus from the comfort of a lovely mountain lodge. Stand on top of the highest peak in Europe – Mount Elbrus! Let Berg Adventures whisk you away for a two-fold adventure in Russia – from city to summit! The journey begins in the world class city of St. Petersburg where we will tour the sites and experience the famous midnight sun. Next we travel by train to Moscow where we will visit iconic locations including Saint Basil’s onion-domed cathedral and the Red Square. From Moscow we will fly to the Caucasus Mountains where life is simple, valleys are green and mountains are high. Here we will do some great hiking and mountaineering with the final goal of climbing the highest peak on the European continent, Mount Elbrus at 18,510ft/5,642m. The Caucasus Mountains are truly special. The region is home to incredibly scenic mountains and yet the area is relatively undeveloped and certainly off the beaten track. There is no denying that the Caucasus are distinctly different from the cities of St. Petersburg and Moscow – you will feel like you are in a completely different country. The Balkar people who are native to the area are a proud mountain people, with their own language and history. They are joined by a seasonal crowd of young Russians and Ukrainians dedicated to snow sports, climbing and living a vigorous life in the mountains. It is an exciting place to explore and we welcome you to join us! To climb Mount Elbrus you need to be in excellent physical condition, but no previous climbing or mountaineering experience is necessary. If you have not been to altitude before, know that this mountain is very high and everything you do will require more effort than normal. 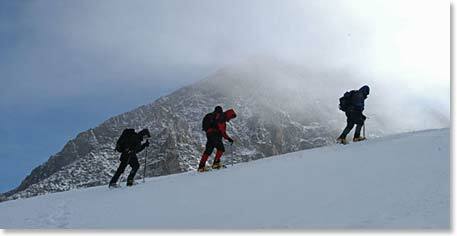 Days are often long, but we move slowly and take frequent breaks to allow our bodies to acclimatize to the altitude. Every night you will return from climbing to find a filling dinner and a warm bed which will also help you to acclimatize. Begin training today to make the most of your adventure! 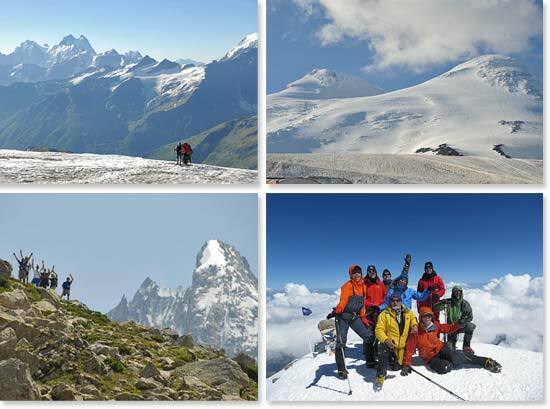 View our previous Elbrus dispatches.